Abstract: The present study focuses on bioprospecting of halotolerant bacteria from a hypersaline environment for antifungal agents against major mushroom pathogens. A total of 20 morphologically different fungi were isolated from composts and infected fruiting bodies of Agaricus bisporus; belonging to the genera Trichoderma, Penicillium, Aspergillus, Mucor and Rhizopus. In addition, 131 halotolerant bacteria out of 280 exhibited antifungal activity against phytopathogens, Trichoderma sp., and Penicillium sp. The isolates (80) showing maximum and consistent activity were screened against the isolated mushroom pathogens, Trichoderma harzianum MTCC 3178 and Lecanicillium fungicola MTCC 2016. About 33.8% halotolerant bacteria produced an antifungal metabolite that inhibited the mycelial growth of Trichoderma harzianum MTCC 3178, 20% inhibited mycelium growth of Lecanicillium fungicola MTCC 2016, 48.8% other Trichoderma spp., 26.3% Penicillium spp. and 2.5% inhibited Aspergillus spp. The bacterial isolate BGUMS93 showed highest broad spectrum activity against these pathogens. Carbohydrate utilization profile, biochemical characteristics and 16S rRNA gene sequencing revealed BGUMS93 as Bacillus sp. (KC991034.1) with 97% similarity to Bacillus subtilis. BGUMS93 produced extracellular antifungal metabolites in butanol extract showing maximum activity against Trichoderma harzianum MTCC 3178 and in chloroform extract against Lecanicillium fungicola MTCC 2016. Thus, Bacillus spp. from Goa’s salterns could be a way to provide natural fungicide as an alternative to synthetic fungicides used in mushroom cultivation. The present study focuses on bioprospecting of halotolerant bacteria from a hypersaline environment for antifungal agents against major mushroom pathogens. A total of 20 morphologically different fungi were isolated from composts and infected fruiting bodies of Agaricus bisporus; belonging to the genera Trichoderma, Penicillium, Aspergillus, Mucor and Rhizopus. In addition, 131 halotolerant bacteria out of 280 exhibited antifungal activity against phytopathogens, Trichoderma sp., and Penicillium sp. The isolates (80) showing maximum and consistent activity were screened against the isolated mushroom pathogens, Trichoderma harzianum MTCC 3178 and Lecanicillium fungicola MTCC 2016. About 33.8% halotolerant bacteria produced an antifungal metabolite that inhibited the mycelial growth of Trichoderma harzianum MTCC 3178, 20% inhibited mycelium growth of Lecanicillium fungicola MTCC 2016, 48.8% other Trichoderma spp., 26.3% Penicillium spp. and 2.5% inhibited Aspergillus spp. The bacterial isolate BGUMS93 showed highest broad spectrum activity against these pathogens. Carbohydrate utilization profile, biochemical characteristics and 16S rRNA gene sequencing revealed BGUMS93 as Bacillus sp. (KC991034.1) with 97% similarity to Bacillus subtilis. BGUMS93 produced extracellular antifungal metabolites in butanol extract showing maximum activity against Trichoderma harzianum MTCC 3178 and in chloroform extract against Lecanicillium fungicola MTCC 2016. Thus, Bacillus spp. from Goa’s salterns could be a way to provide natural fungicide as an alternative to synthetic fungicides used in mushroom cultivation. Agaricus bisporus, known as white button mushroom is one of the most common, globally grown edible mushrooms. The ease of cultivation and its attractive quality and texture along with substantial yield makes it the most cultivated and consumed mushroom. However, they are susceptible to bacterial, fungal and viral diseases (Largeteau and Savoie, 2010). Mushrooms are susceptible to microbial diseases at various stages including compost, casing, spawn run and even mushroom fruiting body. These diseases further propagate through various sources such as air, water, machines and workers causing secondary infections, thereby reducing its yield and marketability. Some of the biggest problems in mushroom cultivation are caused by fungi, namely Lecanicillium fungicola and Trichoderma spp., resulting in severe economic losses. Lecanicillium fungicola (previously known as Verticillium fungicola), the causal agent of dry bubble disease is the most common fungal disease of Agaricus bisporus (Berendsen et al., 2010). This soil-borne pathogen, at an early stage of mushroom growth results in typical onion shaped mushrooms whereas late infection shows traces of grey mouldy fuzz on the mushrooms. Casing soil serves as the source of the infection, however, other factors also lead to the spread of the disease. Another destructive disease in mushroom cultivation is the green mould mainly caused by different species of Trichoderma; Trichoderma harzianum causing the major problem (Seaby, 1996; Savoie et al., 2001). Some species of Penicillium and Aspergillus are also found to be causal agents of green mould. Trichoderma spp. cause major losses as they spread quickly and on a massive scale. They occur in all stages of mushroom growth; soil, organic matter and air, being sources of infection. The control of these soil-borne pathogens requires good hygiene and routine fungicide treatment. However, they are difficult to control either because of lack of an effective chemical control or development of fungicide resistance by the pathogen (Gea et al., 2005). Thus, there is a continuous need for an effective and safer fungicide, and microbial sources may play a key role. Solar salterns are man-made thalassohaline systems with varying salt concentration ranging from 10-350 psu, which are commercially utilized for the production of salt (Kerkar and Bharathi, 2011). Several new compounds from microbes in extreme environments are reported every year, as these are an untapped resource of novel biomolecules such as enzymes, antibiotics and enzyme inhibitors (Zhang et al., 2005; Mondol et al., 2013; Manivasagan et al., 2014; Arasu et al., 2016). Microbial secondary metabolites have been actively studied from marine sources due to its diversity in terms of chemical structures and versatile bioactivity. Thus, the present work was aimed to investigate the potential of hypersaline bacteria from salt pans to suppress mushroom pathogens particularly, Trichoderma harzianum and Lecanicillium fungicola. Halotolerant bacteria used for the present study were procured from Prof. Savita Kerkar’s laboratory collection, which were isolated from the saltern ecosystem of Goa. The standard cultures were procured from Goa University Fungal Culture Collection Centre (Trichoderma sp. GUFCC 5092 and Penicillium sp. GUFCC 396) and Microbial Type Culture Collection, Chandigarh, India (Trichoderma harzianum MTCC 3178 and Lecanicillium fungicola MTCC 2016). The fungi were maintained on potato dextrose agar and stored at 4 ºC. All media were procured from HiMedia, India. Compost (Two samples) and infected fruiting bodies of Agaricus bisporus collected from Zuari Foods & Farms Pvt. Ltd, Goa, India were examined for mushroom pathogens. Each compost sample (10 g) was suspended in 90 ml sterile distilled water, serial diluted and plated on Potato Dextrose Agar. The fungal load from the compost sample was determined. Fungi from the fruiting body were carefully collected and inoculated on Potato Dextrose Agar under aseptic conditions. The plates were incubated at room temperature until fungal growth was visible and pure cultures were obtained by repetitive streaking. Fungi were identified conventionally according to their macroscopic and microscopic features and stored at 4 ºC. Fungi with different colony morphology were used further. The halotolerant bacteria were grown aerobically in Nutrient broth for 96 hrs with constant shaking (120 rpm) at 30 ºC ± 2. The supernatant was collected by centrifugation at 10,000 rpm for 10 mins at 4 ºC, and the cell-free metabolite was used for the antimicrobial assay. The antifungal activity of the bacterial cultures was tested against the standard fungi and isolated mushroom pathogens by well diffusion assay as described by Munimbazi and Bullerman (1998) with few modifications. Initially, 280 bacterial isolates were screened for antifungal activity against standard fungi, Trichoderma sp. GUFCC 5092 and Penicillium sp. GUFCC 396. The isolates showing maximum and consistent activity were further screened against standard mushroom pathogens (T. harzianum MTCC 3178 and L. fungicola MTCC 2016) and isolated mushroom pathogens. In brief, spore suspension (0.1 mL) of respective fungi (107 – 1010 spores/mL) were added to 15 mL of soft Potato dextrose agar and overlaid on pre-poured Potato dextrose agar. Plates were allowed to dry and wells were bored. The cell-free metabolite (50 µL) of each bacterial isolate were added to the wells, and the plates were incubated at 4˚C for 1 h for pre-diffusion and then at 30˚C ± 2 for 3-5 days. The plates were examined for the zone of inhibition. Phenotypic characteristics were determined as described by Bergey’s Manual (Claus and Berkeley 1986). The bacterial isolates were subjected to antibiotic sensitivity testing against 30 different antibiotics using standard antibiotic discs (HiMedia, India). The antibiotic discs were placed on the seeded Muller Hilton agar (HiMedia, India) plates and incubated at 30˚C for 24-48 h (Vasanthakumari, 2009). Carbohydrate utilization pattern of the isolate was also studied using Carbohydrate utilization kit and Hi-Bacillus Kit according to manufactures instructions (HiMedia, India). Genomic DNA was isolated using Axygen Bacterial genomic DNA isolation kit and visualized on 0.8% TBE agarose gel. The 16S rRNA gene of each isolate was amplified by PCR, using universal bacterial primers 27F: AGAGTTTGATCCTGGCTCCAG and 1492R: TACGGTTACCTTGTTACGACTT (Ballav et al., 2015). The PCR product was visualized on 1% agarose gel, and the expected 1.5 kb length band was excised and eluted using GE Health Care, illustraTM GFXTM PCR DNA and Gel band purification kit (United States). The obtained sequence was further analyzed by BLAST software. The phylogenetic tree was constructed using MEGA 7.0 (Pennsylvania, U.S.A) by neighbour joining method. A seed culture of BGUMS93 was prepared by inoculating (approximately 3 x 107 cells/mL) Nutrient broth (10 mL) and incubating for 24 h with constant shaking (120 rpm) at 30ºC ± 2. The seed culture of BGUMS93 was further inoculated in Nutrient broth (500 mL) and incubated at 28˚C ± 2 in a rotary shaker at 120 rpm for 4 days. The culture broth was centrifuged at 10,000 rpm for 10 mins, and cell-free supernatant was used for sequential solvent extraction, lipopeptide precipitation and diaion resin extraction. The culture filtrate was treated with 2g/40mL Diaion HP-20 resin (Supelco, USA) at 120 rpm, RT (30°C ± 0.2) for 30 mins. The mixture was packed in a column, washed with sterile MilliQ water and eluted with HPLC grade methanol. The methanol extract was collected as Fraction A. To the bacterial pellet obtained, 10 mL of Chloroform: Methanol (1:1) was added, vortexed and sonicated for 40 s with pulse and without pulse. After sonicating, it was allowed to stand for 10 mins and centrifuged at 10,000 rpm for 5 mins at 10˚C. The supernatant was collected as fraction B (Banskota et al., 2006). Fraction A & B were used for testing antifungal activity using methanol and methanol: chloroform as respective controls. The cell-free culture filtrate was sequentially extracted with five different solvents (Petroleum ether, diethyl ether, ethyl acetate, chloroform and butanol). The extraction was carried out twice with different solvents at 1:1 ratio. All the solvent extracts were dried under vacuum and the resulting extracts were used with the respective solvents as controls (Sihem et al., 2011). The cell-free culture broth was precipitated by initially adjusting the pH to 2.0 with concentrated HCl and stored overnight at 4˚C. The precipitate was collected by centrifuging at 10,000 rpm for 10 mins and extracted twice with methanol. The collected solution was dried under vacuum and this fraction was subsequently used for bioactivity keeping methanol as a control (Kim et al., 2004). The total fungal load in the compost sample I was found to be 1.4 x 105 CFU/g and sample II was 0.5 x 106 CFU/g. A total of 9 morphologically different fungi were isolated from the two composts and 11 isolated from infected fruiting bodies and identified microscopically. The fungi isolates belonged to the genera Trichoderma, Penicillium, Aspergillus, Mucor and Rhizopus (Figure 1). A total of 280 halotolerant bacterial isolates were assayed using cell-free metabolites against Trichoderma sp., and Penicillium sp., from which only 131 isolates exhibited anti-fungal activity. Of the 131 halotolerant cultures, 119 showed activity against Trichoderma sp. and 47 showed activity against Penicillium sp. However, only 25% showed maximum activity (>20 mm) against Trichoderma sp. and 7.2% showed activity (>20 mm) against Penicillium sp., and only 5.4% cultures showed activity (>20 mm) against both the fungal pathogens. Among the (131) bacterial isolates showing antifungal activity during primary screening, 80 isolates showing maximum and consistent activity were screened further against the standard fungal mushroom pathogens. Figure 2a shows the activity profile against standard mushroom pathogens and Figure 2b against the fungal pathogens isolated by us. About 33.8% halotolerant bacteria produced an antifungal metabolite that inhibited mycelial growth of Trichoderma harzianum MTCC 3178 and 20.0% halotolerant bacteria inhibited mycelial growth of Lecanicillium fungicola MTCC 2016. None of the bacterial isolates showed activity against Mucor sp. and Rhizopus spp. In contrast, about 57.5% bacterial isolates showed no activity against the standard mushroom pathogens and 48.8% showed no activity against all the isolated mushroom pathogens. The halotolerant bacterial isolate showing highest and broad spectrum anti-fungal activity was BGUMS93. BGUMS93 was found to be Gram positive motile rods with central endospore. In addition, BGUMS93 showed sensitivity to several broad spectrum antibiotics (amikacin, amoxyclav, ampicillin, ampicillin/sulbactam, cephalexin, cephalothin, cephotaxime, chloramphenicol, ciprofloxacin, clindamycin, Co-Trimoxazole, deoxycycline hydrochloride, erythromycin, gentamicin, kanamycin, levofloxacin, lincomycin, nalidixic acid, neomycin, nitrofurantoin, ofloxacin, penicillin-G, streptomycin, tetracycline, vancomycin). However, ceftazidime and cefuroxime stimulated the growth of BGUMS93 and methicillin, oxacillin and tobramycin exhibited mild inhibition. 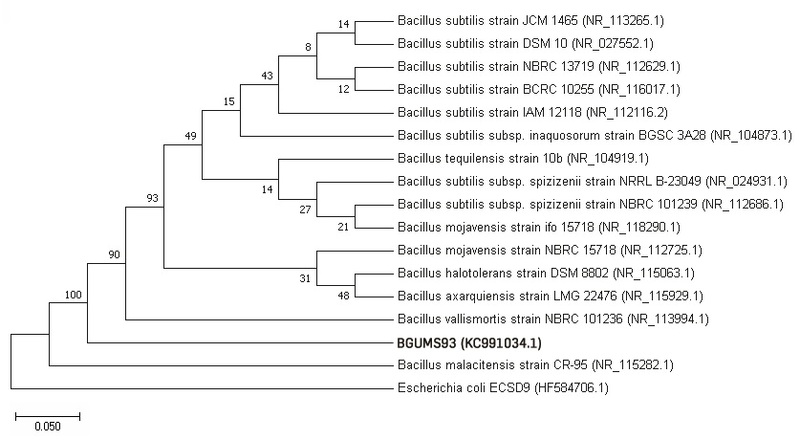 Biochemical characteristics (Table 1) and 16S rRNA gene sequencing revealed BGUMS93 to be Bacillus sp. (KC991034.1) with 97% similarity to Bacillus subtilis (Figure 3). BGUMS93 could grow in salt concentration of 7%, indicating it is a halotolerant isolate. Figure 3 Phylogenetic tree based on 16S rRNA gene sequence of BGUMS93. E. coli ECSD9 was used as an outgroup. The number at the nodes indicate bootstrap values based on 500 replicates. Fraction A showed antifungal activity against T. harizanum and L. fungicola and no activity was observed with Fraction B, suggesting the metabolite was extracellular (Table 2, Figure 4). On sequential solvent extraction, activity was observed with n-butanol extract against both the pathogens, however, a higher activity was observed with chloroform extract against L. fungicola. Lipopeptide extract also showed activity against both the pathogens, initially suggesting that the antifungal compound could be a lipopeptide. However, the activity of the lipopeptide extract was lower compared to that of the solvent extract. Bacillus spp. are known to produce several antifungal compounds including fungycin (Lebbadi et al., 1994), bacillomycin (Xu et al., 2013), iturin (Romero et al., 2007; Gong et al., 2015), which makes it a best fit candidate for biocontrol of several phytopathogens. Apart from this, marine Bacillus have been reported to have antibacterial (El-sersy et al., 2012; Khan et al., 2017; Mayer et al., 2017) and anti-larval activity (Gao et al., 2010). Macrolactins and lipopeptides are also produced widely by marine bacilli showing potent anti-microbial activities (Pabel et al., 2003; Sohn et al., 2008; Lu et al., 2008; Ongena and Jacques, 2008; Jaruchoktaweechai et al., 2000; Mondol et al., 2011; He et al., 2013; Xu et al., 2014; Zhang and Sun, 2018). Essential oils have been effectively inhibitory to the major mushroom pathogens; however, its practical application has yet not been established (Sokovic and Griensven, 2006; Angelini et al., 2008; Tanovic et al., 2009). In contrast, leached spent mushroom compost (SMC) was found to suppress the growth of the mushroom pathogen, L. fungicola, and found effective in increasing the mushroom yield. The disease suppression was attributed to Bacillus spp., isolated from the extracts of leached SMC (Riahi et al., 2012). Several studies have also been carried out on the antagonistic effects of Bacillus spp. against Trichoderma harzianum in Pleurotus spp. cultivation (Chittihunsa et al., 2007; Velazquez-Cedeno et al., 2008; Kim et al., 2008; Shah and Nasreen, 2011). Savoie et al. (2001) suggested that the capacity of T. harzianum to colonize mushroom compost was due to its resistance or tolerance to the inhibitory effect of the microorganisms present in the compost. Although Bacillus subtilis is an established biocontrol agent, Zhang et al. (2009) suggested two different strains of Bacillus subtilis could differ in their antagonistic profile depending on their inter and extracellular proteins. The increase in the incidence of fungicide resistance among the mushroom fungal pathogens has established the need for an effective and broad spectrum fungicide. BGUMS93 showed broad spectrum antifungal activity to different species of mushroom pathogens. The crude culture supernatant and n-butanol extract showed effective inhibitory activity against T. harzianum. In addition, chloroform extract along with the culture supernatant showed strong inhibitory activity against L. fungicola. Thus, making BGUMS93, a Bacillus sp. isolated from a Goan saltern as an ideal biocontrol and effective antimicrobial agent. However, further studies are required to determine the ability of the strain to control these diseases. This is the first report of antifungal activity against T. harzianum and L. fungicola by a Bacillus sp. isolated from a saltpan and hence, it may provide an alternative resource for biocontrol of mushroom diseases. Acknowledgments: Authors are grateful to Head of the Department, Department of Biotechnology, Goa University, for providing the facility. Authors also wish to thank Dr. S. Kurade for providing the compost and mushroom samples. This work was supported by the University Grant Commission -Maulana Azad fellowship [MANF-2012-13-CHR-GOA-12673 to M.S.F]. Chittihunsa, T., Bangeekhan, E., Wongsamitkul, N. & Subsomboon, T. (2007). Screening of Bacillus spp. suppressing the infection of Trichoderma sp. in mushroom cultivation. KMITL Science and Technology Journal, 7(1), 19-27. Khan, M. N., Lin, H., Li, M., Wang, J., Mirani, Z. A., Khan, S. I., Buzdar, M. A., Ali, I., Jamil, K. (2017). Identification and growth optimization of a marine Bacillus DK1-SA11 having potential of producing broad spectrum antimicrobial compounds. Pakistan Journal of Pharmaceutical Sciences, 30(3), 839-853. Lebbadi, M., Galvez, A., Maqueda, M., Martinez-Bueno, M., & Valdivia, E. (1994). Fungicin M-4: a narrow spectrum peptide antibiotic from Bacillus licheniformis M-4. Journal of Applied Bacteriology, 77(1), 49-53. Munimbazi, C., & Bullerman, L. B. (1998). Isolation and partial characterization of antifungal metabolites of Bacillus pumilus. Journal of applied Microbiology, 84(6), 959-968. Romero, D., Vicente, A., Rakotoaly, R., Dufour, S. E., Veening, J., Arrebola, E., Cazorla, F. M., Kuipers, O. P., Paquot, M., & Perez-Garcia, A. (2007). The Iturin and fengycin families of lipopeptides are key factors in antagonism of Bacillus subtilis towards Podosphaera fusca. Molecular Plant-Microbe Interactions, 20(4), 430-440. Tanovic, B., Protocnik, I, Delibasic, G., Ristic, M., Kostic, M., & Markovic, M. (2009). In vitro effect of essential oils from aromatic and medicinal plants on mushroom pathogens: Verticillium fungicola var fungicola, Mycogne perniciosa and Cladobotryum sp. Archives of Biological Sciences Belgrade, 61(2), 231-237. Vasanthakumari, R. (2009) Practical Microbiology. New Delhi: BI Publication.